Micrograph o Golgi apparatus, visible as a stack o semicircular black raings near the bottom. Numerous circular vesicles can be seen in proximity tae the organelle. 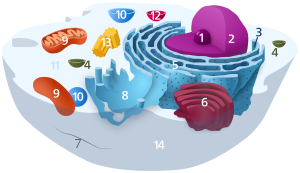 The Golgi apparatus, an aa kent as the Golgi complex, Golgi body, or srmply the Golgi, is an organelle foond in maist eukaryotic cells. It wis identifee'd in 1897 bi the Italian scientist Camillo Golgi an named efter him in 1898. Pairt o the endomembrane seestem in the cytoplasm, the Golgi apparatus packages proteins into membrane-boond vesicles inside the cell afore the vesicles are sent tae thair destination. The Golgi apparatus resides at the intersection o the secretor, lysosomal, and endocytic pathweys. It is o pairteecular importance in processin proteins for secretion, contrrnin a set o glycosylation enzymes that attach various succar monomers tae proteins as the proteins muive throu the apparatus. This page wis last eeditit on 24 October 2018, at 19:38.